It's... big. 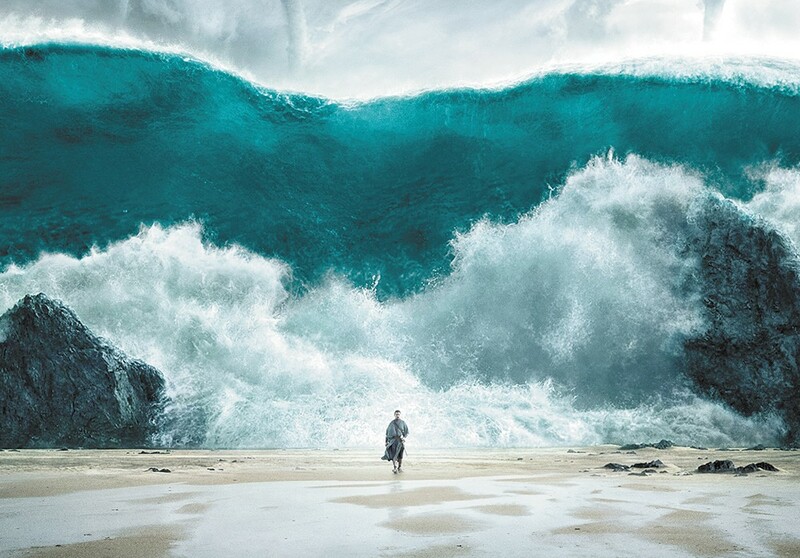 Whatever else you might want to say about Ridley Scott's Exodus: Gods and Kings, you can't deny that it's big. Big scale on the CGI-enhanced sets, big crowd scenes, big plagues, big acting — they're all here. Pull out your thesaurus and substitute every synonym for "big" that you can find — vast, immense, colossal, jumbo — and they will all apply. Except for God. The Lord Jehovah is represented in this movie as a child. But we'll get to that. Hollywood cinema in the early 21st century is a parade of attempts by movies to top the bigness of the movie that came before. Every superhero movie has its city-leveling apocalyptic battle; every blockbuster needs its IMAX-sized set pieces; every literary adaptation has its all-star cast. An industry desperately looking to get butts in seats keeps turning to sheer enormity as a way to counteract the universe of things people can watch any time they want on small screens — and, just as happened in the 1950s, when Hollywood was battling the rise of television, that means turning to Biblical epics. Here, Scott and his team of writers have turned to the story of Moses (Christian Bale) and Rhamses (Joel Edgerton), raised as brothers in the palace of Egypt's pharaoh, until Moses learns that he was actually born of the Hebrews who serve as Egypt's slaves and becomes their leader in their fight for freedom. But the film also turns back to the grand tradition of films like The Ten Commandments in its hilariously oblivious casting decisions. Controversy has already swirled around the casting of Bale as Moses and the paucity of Middle Eastern actors among the film's "Egyptians," but it's also hard to deny the high comedy of John Turturro as the pharaoh Seti, or Ben Mendelsohn going full leering effeminate as the corrupt Egyptian viceroy Hegep. It's even harder to deny that Scott — who honed his period-epic chops on Gladiator and Kingdom of Heaven — knows how to deliver spectacle, if spectacle is what you came for. The pyramid-and-statue-studded cityscapes of the Egyptian capital of Memphis are as impressive in their aboveground scale as the slave quarry at Pithom is impressive in its belowground scale; the opening battle between Egyptian forces and the Hittites manages some effectively controlled wartime chaos. The landslide along a mountain path that wipes out many of Rhamses' troops feels genuinely catastrophic, and the wave that returns the water to the parted Red Sea... well, it's big. Really, really big. What's odd about Exodus: Gods and Kings is that even as it's pulling out all the stops for visual grandeur, it's trying desperately to provide a humanized, naturalistic approach to the story's mythological characters and supernatural events. The Nile runs with blood, this version is careful to explain, merely as the result of a crocodile feeding frenzy gone haywire, and the flies come because, well, what do you expect with all those dead fish and frogs, and thence the diseased livestock, and so forth. Meanwhile, Rhamses alternates between vaguely petulant jealousy at the preference shown to his adopted brother Moses and doting father to his infant son, with Edgerton seeming truly baffled as to how to play him. Bale seems even more confused in his swings between nobleman, courtly wooer of his wife Séfora (María Valverde) and tormented de facto Hebrew leader who somehow develops the accent of an old Jewish man from Brooklyn during the film's second half. The narrow line between prophet and lunatic walked by Russell Crowe in Noah looks all the more impressive by comparison. Exodus: Gods and Kings and Exodus: Gods and Kings 3D are not showing in any theaters in the area.